This song was used as the music for Psalm 55. Four months after writing Song 115 – Enough in February of 2005 about my ancestors, I wrote this song about children. Verse 4 mentions “children love to go to the park,” and this brings to mind when Roice and Ben and I would hike to the park at the end of Lockmore Lane, our second house in Dallas. Other than this line, this song is not written about my children. Rather, the song is an observation of children in general. Maybe I wrote this because of years teaching primary and Sunday School. Maybe it was because Matt graduated from High School about this time in 2005, and we were no longer going to have children in our home. Whatever the origins, there are interesting truths: “Children are an inheritance of the Lord;” children “bring to us lasting joy;” “Creating a great fuss, whether girl of boy;” “Children cannot lie, though they’re often good at hiding the truth;” “Children want everything;” “Children are full of light, trailing clouds of glory from before;” “Children are sometimes very bright, teaching the rest of us new types of lore;” “Children carry the iniquities of their fathers in their minds and family traditions;” and “Children know the love of their mothers.” The line about being afraid of the dark and imaging demons underneath the bed, seem to relate to Disney/Pixar’s movie: Monsters, Inc. 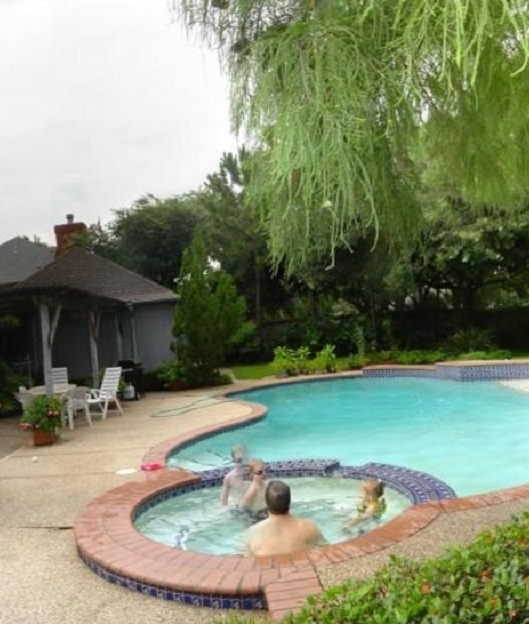 So, what better photo to use than children playing in the pool at 1307 Emerald Green Lane. 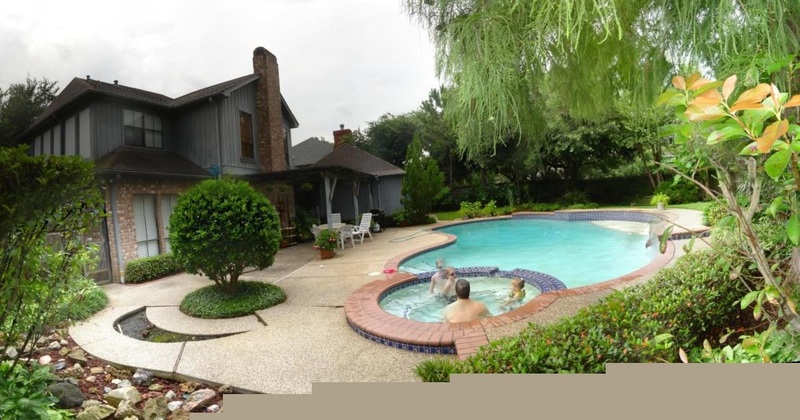 This picture appears to be of Grant (who seems to be jumping into his skin in this panorama photo), Ella, and Paul.